Oasis Cancun is Selling Out! Every year Oasis Cancun is the FIRST spring break resort to sell out! Visit STS Travel now to make your reservation now to guarantee your room at the best spring break resort in all of Cancun! The Summit is made of oversized suites and can accommodate up to 6 people. All suites have kitchenettes, daily maid service and private balconies looking over the golf. 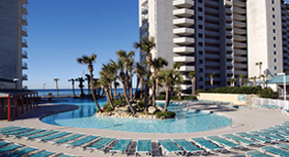 Summit is also located right in between the two largest spring break clubs in the south- Spinnaker and La Vela! This beautiful resort is surrounded by 1,300 feet of emerald waters and white powder beach. Switch it up and take your crew to the tropical Lagoon Pool to hang out. Each room includes complete kitchen, balconies, living room and more!